The entire crew at a railroad work site in the Syrian desert is mercilessly slaughtered. A German spy in Constantinople is mutilated and killed as the Kaiser backs the building of the Baghdad Railway, which will connect Berlin to the Persian Gulf. The British Foreign Office dispatches Lord Leighton, an accomplished Orientalist and commissioned army officer, to spy out progress on the railway and to stop it if he can. On the threshold of war in 1910, the British, German and Ottoman empires are vying for position in the Middle East as London tries to fend off Germany’s threat to its rule in India. From legendary Constantinople across a rugged terrain of mountains, tundra and desert, Leighton follows the trail to Baghdad as he attempts to fulfill his mission. 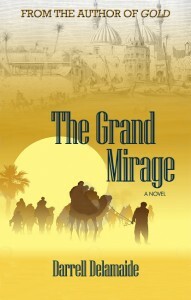 The Grand Mirage is an historical thriller that combines Wilbur Smith’s sense of rugged adventure, Eric Ambler’s taste for intrigue and Alan Furst’s period atmosphere to transport the reader back to an exotic Orient now lost to history. 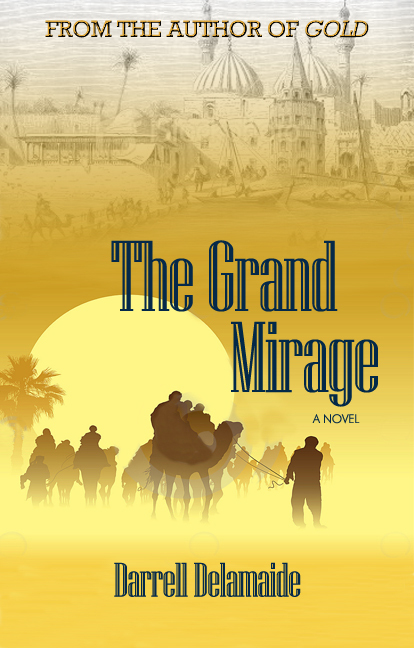 “A must-read for historical fiction fans….Like a desert sirocco, it will sweep you away into an era whose echoes still reverberate and a region that dominates today’s headlines.” Kindle bestselling author James Bruno. Darrell Delamaide is a veteran journalist who has reported from five continents. He is the author of three previous books, including Gold, a financial thriller. He lives in Washington, D.C.